New Winter 2018: This genuine glass Christmas ornament is full of fun, a pair of beach chairs in the sand, facing the ocean or lake while enjoying the setting sun. 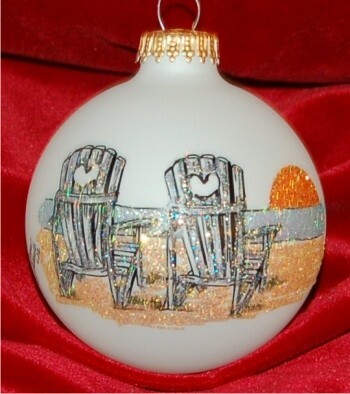 The beach vacation chairs in the sand glass ornament is a favorite beach ornament from Russell Rhodes. It is one of many beach themed Christmas ornaments in our travel ornament section, so putting together a collection of mementos from special trips anywhere in the world is possible. Add a touch of memory to the tree this year with the two beach chairs sunset travel ornament that will be a sentimental favorite every year.